Graham Macgregor-Smith, a long-time supporter of Action Medical Research, has just completed his 3,200 mile cycling challenge across the USA. 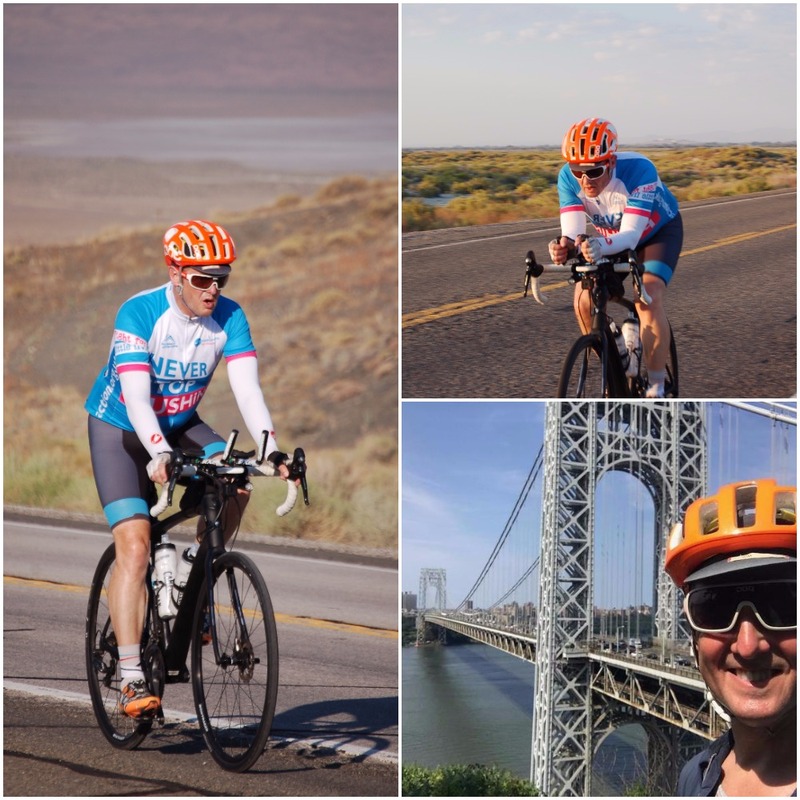 In an effort to raise £10,000 for us, the 54-year-old spent a month riding from San Francisco Bay Area, California to Battery Park, New York. Firstly Graham, congratulations on completing your challenge! What was going through your mind when you reached Manhattan and got off your bike for the final time?! Thank you guys. I’m delighted that I managed to complete the ride in the way that we’d planned. On the final day, I stopped for photos at the overlook of The George Washington Bridge (GWB). It was there that the realisation that I was actually going to finish first hit me; Then I cycled across the bridge and made my way down the west side of Manhattan Island following the Hudson River Parkway. It was a Sunday afternoon and the cycle lane was busy with all sorts of traffic - joggers, dog walkers, families, tourists, hipsters - so when I actually found myself at Battery Park (my final destination) my first thoughts and feelings were of relief! The GWB was busy with traffic when I crossed, so I knew that the boys (the support team) would be sometime behind me. While I waited, there were a whole host of thoughts elbowing each other aside for mind space. The biggest one was that I wouldn’t have to get on the bike again - and could start to repair my "saddle interface" - which was in quite a state after 30 days riding. Then I realised that I’d be going home soon, and remembered how long it had been since I’d last seen my wife and kids. It’s an incredible accomplishment - how many miles did you average per day? I averaged about 108 miles a day, with some significant variations as the ride progressed. The first two weeks averaged at about 93 miles a day, with a short ‘Day 4’ at 61 miles and a long ‘Day 5’ at 113 miles. Week three got a bit crazy, as we’d planned that I would ride 700 miles in five days, including two back-to-back days just short of 160 miles each. The final week was even tougher as we’d planned four days of 120+ miles in a row riding through Pennsylvania, where there's a ridiculous amount of climbing to be done. You obviously made it back home in one piece (!) Were there any scary / unexpected moments? 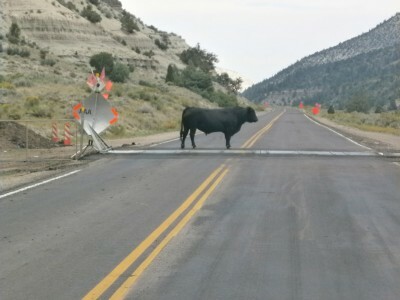 In hindsight, the scariest moment was negotiating my way past a bull that was standing in the middle of the road as I was coming down Indian Canyon in Utah. I must also confess to a degree of anxiety in the Rocky Mountain National Park... It was absolutely bursting with wildlife, and while making the climb up to 12,200 feet, my mind couldn’t help dwelling on the possibility of a bear attack! Luckily there wasn’t one! If you had to choose one highlight of your trip, what would it be? Riding in the Nevada desert along Highway 50, the “loneliest highway in America” and detouring deep into the desert along Highway 722. The temperatures were in to the 40s, I was in full cooling kit, and saw nobody for hours… until bumping into a solitary cowgirl, riding her horse, herding cattle up the road! What was your favourite State that you passed through? Is there anywhere you’d like to revisit? I’d say Utah was probably my favourite because, geologically, it is incredible! Pretty well the entire geological history of Utah is visible in some way or another, and when you then add in the climatic erosion that has occurred over the millennia, it makes for incredibly powerful vistas and landscapes. In terms of places I’d like to revisit… If I had unlimited time, I’d want to go back to all of them as there was something individual and special about each and every one. If I was allowed to only go back to one though, it would have to be Utah. It’s perhaps a little too soon to even think about, but do you have plans for any future challenges like this one? I’m going to sit “on my laurels” for a while. However, I do have an itch to scratch that is closer to home and that’s following an approximation of Hannibal’s route starting in Spain, heading through France, over the Alps and down through Italy where one could finish in Rome or head on down to Calabria. Also, I love the idea of Central Asia, so the ‘Silk Route’ sounds like a fascinating basis for a ride.